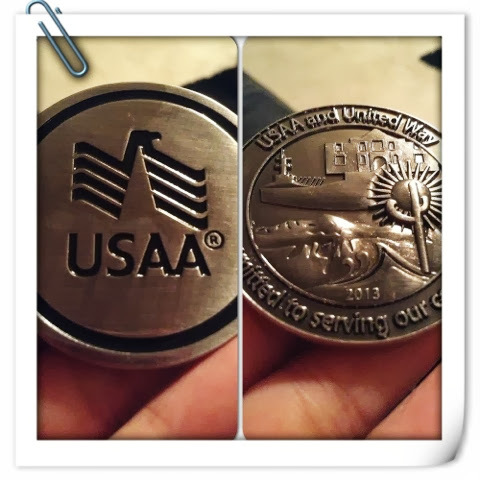 Hubby got another United Way coin from his work today. USAA has been committed to helping members and the communities via United Way. During World War I, a lieutenant in one American squadron proudly had medallions engraved with the squadron's emblem and gave one to each member of his group. The lieutenant placed his medallion in a secure place, a small leather pouch carried on a chain around his neck. While flying a mission, his aircraft was shot down by a German patrol. To discourage escape, his captors took his personal identification, all except for the pouch with the medallion. He was then taken to a small French village near the battlefront. That night, he escaped but without his personal identification. He cautiously crossed the countryside and eventually came upon a French outpost. Unknown to him, the area had experienced many saboteurs, sometimes disguised as civilians. The American with strange accent immediately attracted attention as a possible saboteur. His French captors prepared to execute him. As he was being led away, he remembered his leather pouch and showed his would be executioners the medallion. They recognized the squadron insignia and were able to confirm his identity. Rather than being executed, he was recognized for his service and his courage. The medallion, now known as a coin, saved his life. Maayo paka bayot ky imu jd gihipus tanan. akong manghud kung maka receive iya bana ug ingon, mga pin ky iya ra pasagdan. Aww those are nice collectible coins sis.